2015_04_10_LabourParty_248_IMG_1104 by Labour Party, on Flickr. Scottish and rUK Labour, and the latter might be easier to understand if seen as straddling two quite diverse areas. However, let’s first have a look at the pandaified party north of the border. Some observers — mainly those based in London — seem to think Scottish Labour might bounce back in five years’ time. I don’t think so. Of course they might regain a few seats, but most of the new SNP voters have switched for good — they haven’t just temporarily lent their vote to another party. Furthermore, they might still be Scotland’s second-largest party, but their voters are in the “wrong” places, making it very hard for them to stage a come-back. For instance, there are only four seats that can be taken from the SNP on a swing of less than 10%: Berwickshire, Roxburgh & Selkirk (which will fall to the Tories on a swing of 0.8%), Dunbartonshire East (4.9% to go Lib Dem), Edinburgh West (7.5% to go Lib Dem) and East Renfrewshire (8.1% to go Labour). All other seats require a swing from the SNP of more than 10% to go Unionist, and a great number of Labour’s old seats require a swing of more than 20% to revert to the status quo ante referendum. This is simply not going to happen unless Labour completely reinvents itself, and even then it might take decades. 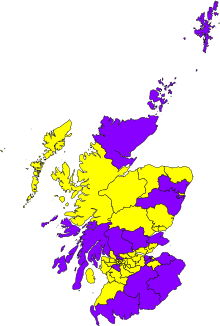 Which seats would a Better Together electoral alliance have won last Thursday (in purple), and where would the SNP still have won (in yellow)? Even if the three Unionist parties decided to merge as the Better Together Party north of the border, it wouldn’t save them. If we imagine such a party had been standing last Thursday, only 19 of Scotland’s 59 seats would have gone Unionist (assuming that all current Labour, Tory and Lib Dem voters had supported it). Sadly for Labour, they were the largest of the three amigo parties in only 8 of them (4 lean towards the Tories and 7 towards the Lib Dems). Nevertheless, the Better Together route is probably the least bad prospect for Labour. The swing required to retake most of the Central Belt seats is so enormous that it’s simply not going to happen. At least as a new Unionist party they will have a chance to win some seats back in five years’ time (if Scotland hasn’t left the Union by then, of course). In the rUK, Labour’s main rival isn’t a progressive Social Democratic party, so the way forward is likely to be very different. At the moment, the most prominent candidates to take over the leadership of UK Labour (such as Chuka Umunna) seem to be focusing on the swing seats they failed to take from the Tories, and as a result they’re prescribing Blairite medicine, i.e., copying the Tories’ policies. However, we know well where that ends: Voter apathy in the first instance, and eventually it allows new parties to take over from the left — it would have been almost impossible for the SNP to become so popular if Tony Blair hadn’t pulled his party so far away from the Scottish consensus. In other words, a Blairite leader might retake some southern seats, but it will probably lead to huge advances for the Greens and UKIP (and perhaps even the Lib Dems) in Northern England in five years’ time. Triangulation might work in the US, where there are only two significant parties, but in multi-party Britain it leads to electoral disaster after a few years. To return to Paul Mason’s tribes, the Blairite Third Way might work in the asset-rich south-east, but it will eventually cause Labour to collapse in post-industrial Britain, just like what happened last Thursday in Scotland. In England, the Tories got 41% of the votes, while Labour got 32%, the Lib Dems 8%, UKIP 14% and the Greens 4%. Now, I don’t believe all UKIP’s voters are racists; many of them are just ordinary people who feel abandoned by the political classes in London, and UKIP seems to them to represent the most authentic working-class voice in England, so let’s assume that a more traditional working-class alliance could recapture at least half of them. If such an anti-Tory alliance could unite Labour, the Lib Dems, the Greens and half of UKIP, it would have won 51% of the votes in England last Thursday, which would have been translated into 299 seats (and the Tories would have got the remaining 234 seats). Given that this alliance would also have gained the majority of seats in Wales and would have found it easy to work together with the SNP, if would have been able to command an enormous majority in the House of Commons. In other words, UK Labour doesn’t need to copy UKIP’s xenophobic ideas or the Tories’ austerity policies to win. All it takes is a genuine working-class alternative to the Tories, probably with policies very similar to the SNP’s in Scotland. Let’s not forget that the Tories got more than half the votes in only 175 constituencies, so the only reason they’re in power today is because the English opposition is fragmented. Of course, assembling such an alliance wouldn’t work in Scotland because the SNP is already occupying this space, so here a better alternative for Labour is probably to set up a Unionist alliance, as discussed above. @arcofprosperity Paul Mason Scandi-Scotland/Tribes link, please? 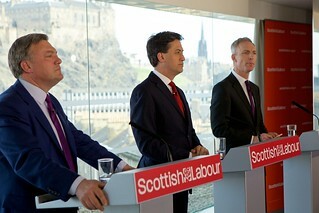 @arcofprosperity gives a fresh analysis on what Labour need to do in Scotland & rUK. @arcofprosperity Interesting. I can’t see Lab/Tory/LDs merging into 1 party. If they did, it rather implies there’s no difference btwn them. @meljomur @arcofprosperity I’ve seen talk of merging Lab-Lib-con into unionist party but think that would be last nail in union’s coffin. @meljomur @arcofprosperity There are very few real “unionists” here, ie put that first, and few will want Northern Ireland style politics. @cath426 @arcofprosperity I agree. It is basically saying to the public, there is absolutely no difference between us. RT @meljomur: @arcofprosperity gives a fresh analysis on what Labour need to do in Scotland & rUK.